Ar fore Gwener 21 Hydref 1966, fe lithrodd ton o wastraff glo lawr y Dyffryn yn Aberfan Tomen rhif 7 o Lofa Merthyr Vale, uwchben y pentre, oedd tarddiad y don hon. 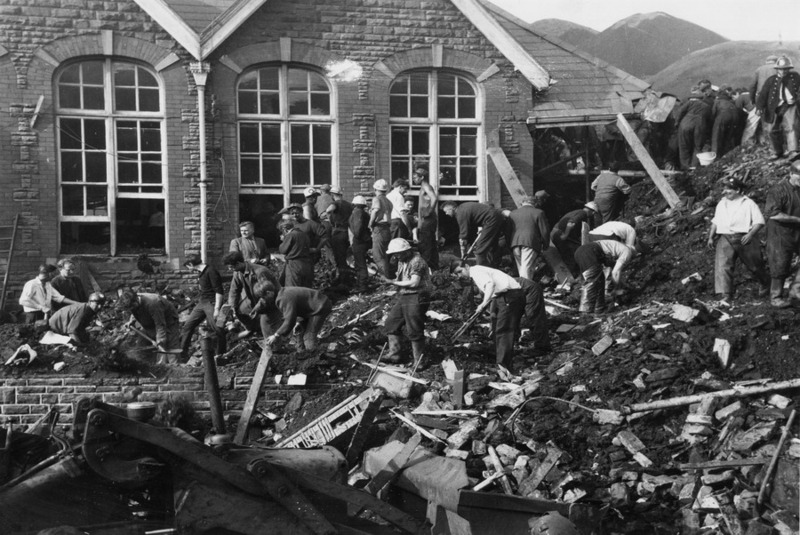 Am tua 9.15yb fe wnaeth y gwastraff glo hwn daro Ysgol Gynradd Pantglas ym mhentref Aberfan a dinistro nifer o dai gerllaw. 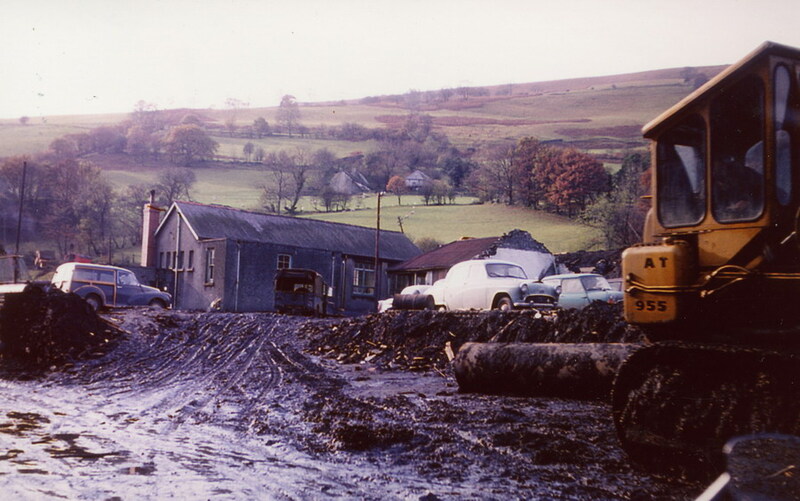 O fewn pum munud cafodd 116 o blant a 27 o oedolion eu lladd yn y gyflafan- y mwyafrif o fewn muriau’r ysgol gynradd. Roedd y plant wedi dychwelyd i’r dosbarth yn dilyn gwasanaeth y bore- yr olaf cyn gwyliau hanner tymor. 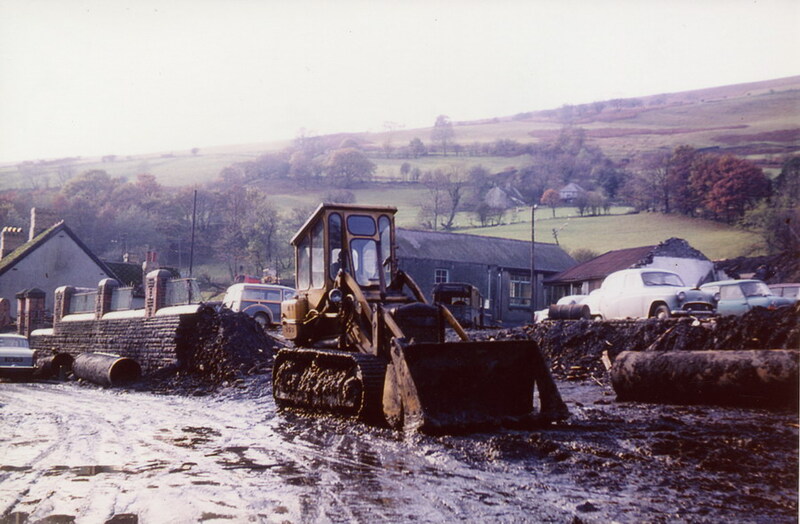 Fe wnaeth y gwastraff glo daro’r dosbarthiadau yng nghefn yr ysgol gan ladd y brifathrawes, pedwar o athrawon a bron bob un disgybl yn y rhan hon o’r adeilad. 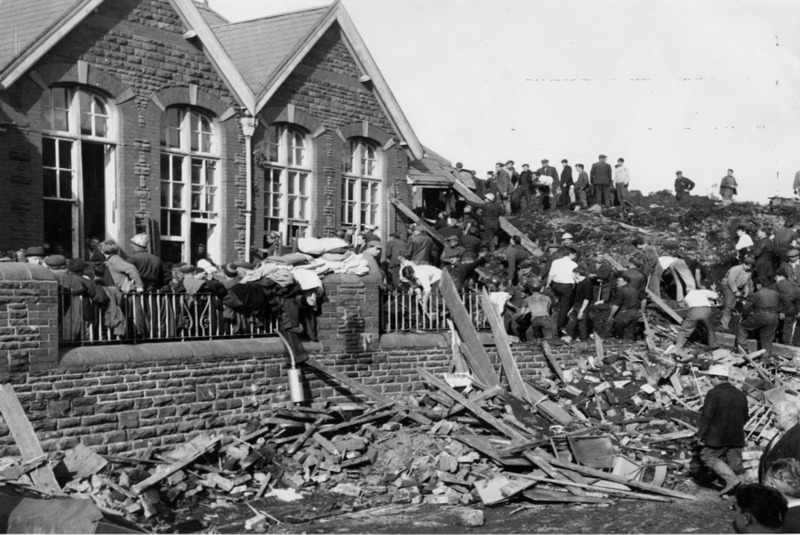 Yng ngheiriau rhai o’r athrawon wnaeth fyw, oedd yn dysgu mewn rhan arall o’r adeilad, “we heard a tremendous rushing as thought a whirlwind had struck and then came absolute silence”. 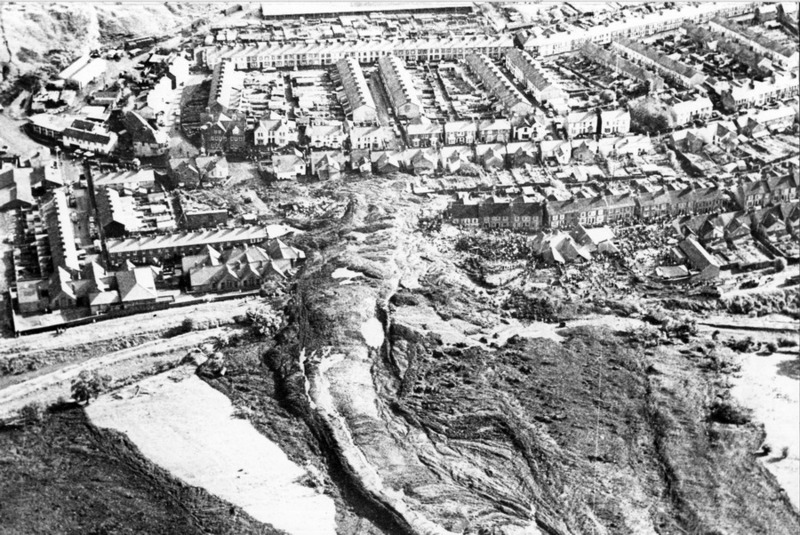 (FFynhonell: Aberfan and the Teachers). Yn dilyn y gyflafan fe ruthrodd glowyr, rhieni a phobl lleol i’r ysgol i gloddio er mwyn ceisio cael y plant allan. I ddechrau dim ond rhawiau a bwcedi oedd ar gael, gyda rhai yn defnyddio llaw. Er gwaethaf yr holl gloddio ni ddarganfyddwyd neb yn fyw ar ôl 11:00 y bore hwnnw allan o’r domen. 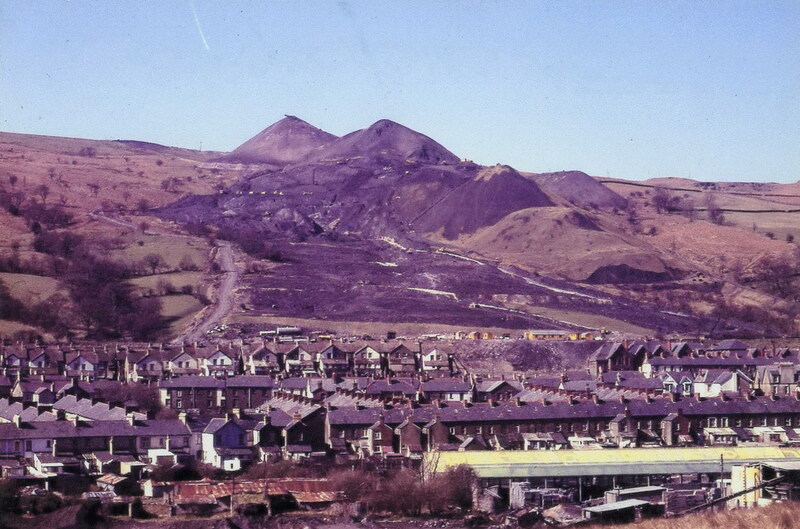 Yn ystod yr oriau a ddilynodd fe ddaeth pobl o bell ac agos i Aberfan i gynnig cymorth a chefnogaeth i’r gymuned. 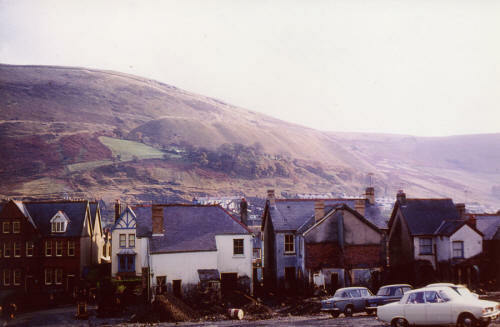 Cymrwyd bron i wythnos i ddarganfod yr holl gyrff. miliwn. Mae cymoedd diwydiannol y De wedi profi sawl trychineb fawr yn y dau can mlynedd diwethaf, ond beth sydd mor enbyd am drychineb Aberfan yw fod mwyafrif y meirw yn blant bychain- heb gael cyfle i fyw bron dim o’u bywydau. On Friday morning 21 October 1966, a wave of coal waste slid down the the Aberfan Valley. 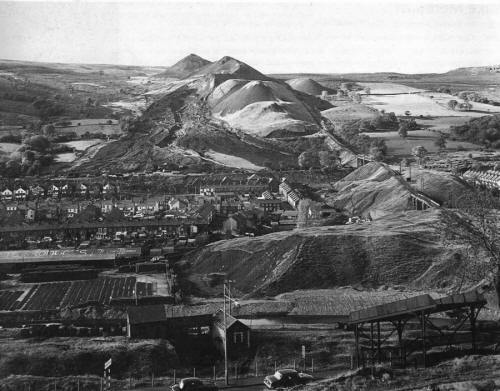 The source was tip number 7 of the Merthyr Vale Colliery, located above the village. At approximately 9.15am this coal waste hit Pantglas Junior School in Aberfan village and destroyed a number of houses nearby. In less than five minutes 116 children and 27 adults were killed in the disaster- the majority within the primary school walls. Following the disaster colliers, parents and local people rushed to the school to dig, in an attempt to get the children out. 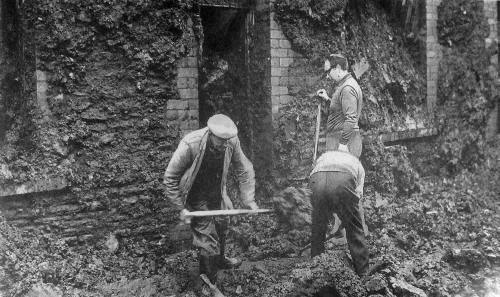 To start, only spades and buckets were used to dig- with some using their hands. Despite all the digging nobody was dug out of the coal waste alive after 11:00am that morning. 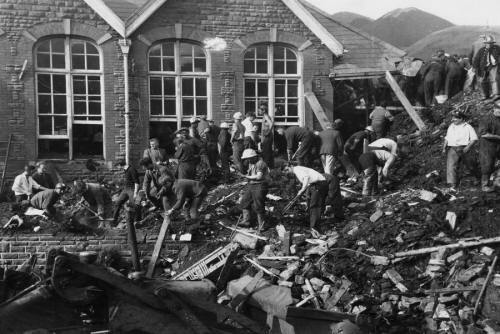 During the hours that followed people from near and far came to Aberfan to offer support and help. It took nearly a week for all the bodies to be recovered from the school. On the following Thursday after the disaster many of the bodies were buried in a mass funeral, the rest were buried in private funerals. Messages of condolence came from all corners of the world in the days and weeks that followed, and the disaster fund raised over £1.75 million. 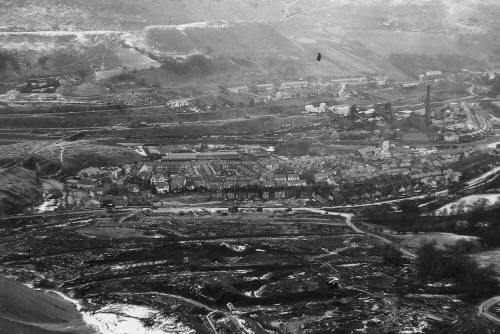 The South Wales Valleys have suffered a number of terrible disasters in the last 200 years, but what makes the Aberfan disaster worst is the fact that most of those killed were children- who didn’t have the opportunity to live their lives. 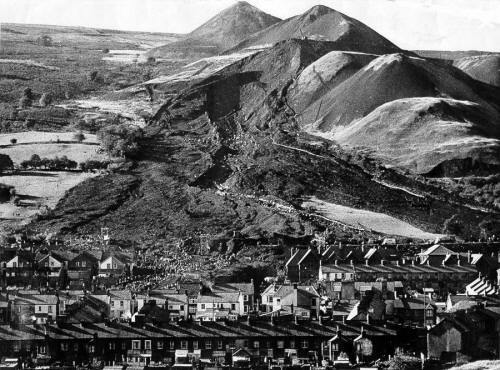 The saddest day in the history of the Borough of Merthyr Tydfil was Friday 21st October 1966, the Aberfan Disaster. In the previous 10 years there had been a good deal of correspondence between Merthyr Council and the National Coal Board concerning the tip. 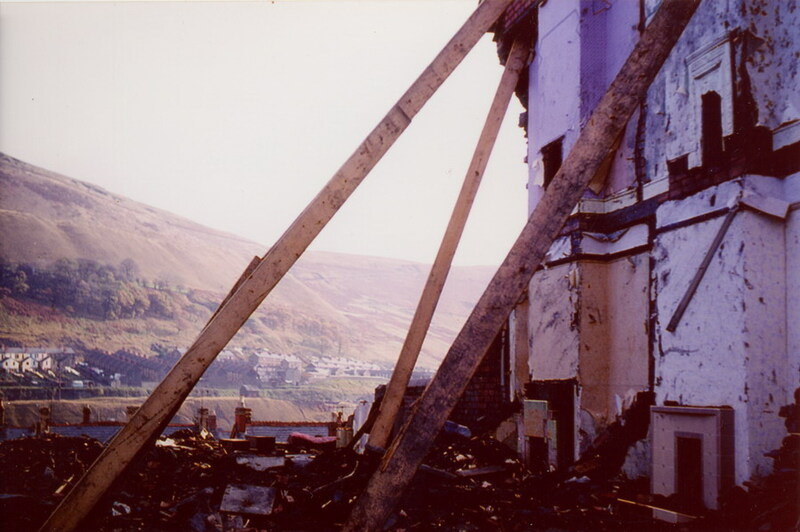 One Council official even wrote, ‘ You are no doubt aware that tips in Merthyr Vale tower above the Pantglas area and if they were to move a very serious situation would occur’. 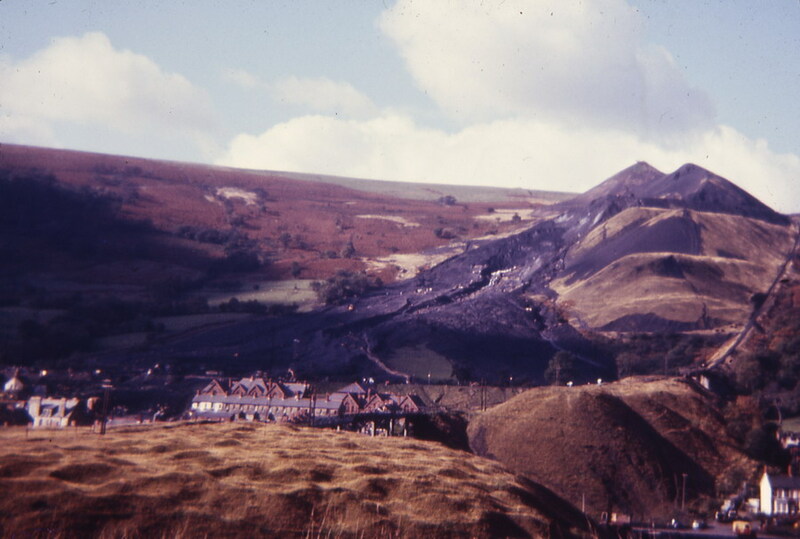 Over a week of heavy rainfall caused a mountain of slag to move incredibly quickly, engulfing Moy Road and Pantglas School just as junior school children were inside. 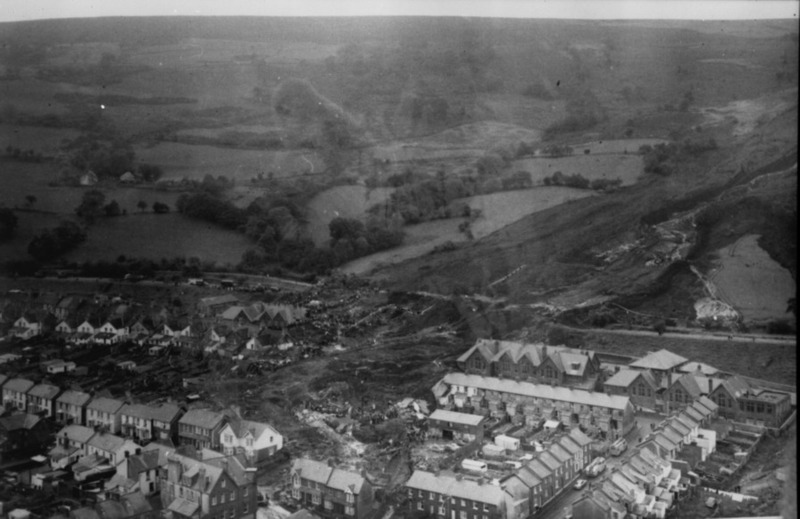 The tragedy caused the sad death of 28 adults and 116 young children. It is a day that few would ever forget. 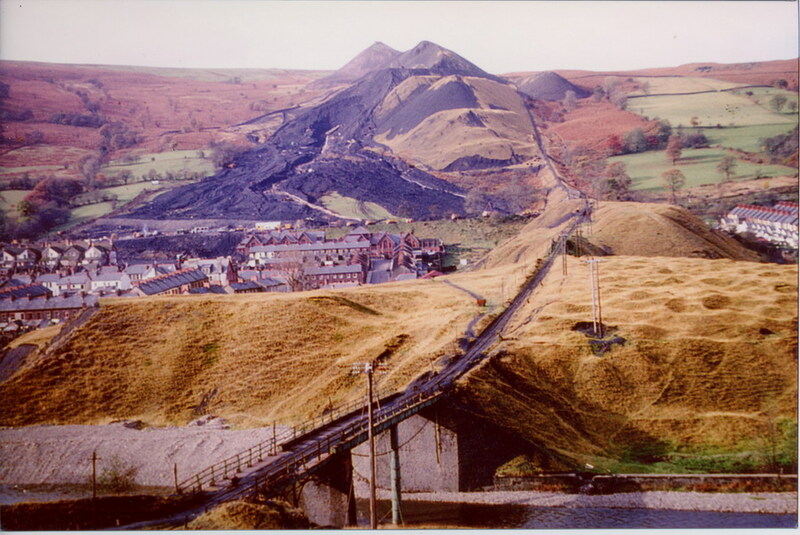 The tribunal that was held afterwards concluded that ‘ Blame for the disaster rests upon the National Coal Board’. This Aerial view was taken at 14:00hrs on the 21st October. Just 4 hours 45 minutes after tip No 7 standing high above the village slipped and descended on Pantglas Junior School and Moy road. Charles Nunn, a member of the Regional Crime Squad was based at the Mortuary that was set up at Bethania Chapel in the village, writes this. “Now nearly 80 years of age and living on the Wirral peninsular, I was a member of the former Newport Borough Police and, as a Detective Sergeant/ Acting Detective Inspector I was seconded to the Welsh Regional Crime Squad from 1965 to 1970. As you are no doubt aware, in October 1966 Aberfan was in the area covered by the old Merthyr Borough Police. A Force with, I think, just over 100 men. Totally overwhelmed by the Disaster, they requested assistance from surrounding Police Forces including big brother Glamorgan. The Regional Crime Squad were requested by the Chief Constable to set up and run the mortuary. By noon on that dreadful Friday we were established in the mortuary in Bethania Chapel in Moy Road and I was designated as the Senior Identification Officer. My team worked 12 hour shifts for 15 days until the last body and, sadly, body piece, were identified and handed over to the undertakers. With my journey back and forth from my home in Newport we were away for something like fifteen hours each day. No overtime was paid in those days of course and we took that, and eating our sandwiches in the school room as part of our duty. I have lectured on the disaster at various Police courses and to Rotary and other organisations. I often get asked about what "counselling" we received? I always reply that counselling was not then the Industry it now is and, as mainly ex-servicemen and experienced Detectives, we would have laughed it off if it had been offered. After leaving Aberfan, we had two days leave before resuming normal Crime Squad duties. I was interviewed by Melanie Dole, a BBC Wales reporter, for both television and radio for their commemoration of the 40th. Anniversary. Whether I will still be around or contacted for the 50th. in 2016 I do not know. Two names that I remember well. The Reverend Kenneth Hayes whose son Dyfrig died at the school. Although obviously grief stricken, he was a great supporter to those of his church members who had lost loved ones. I recall asking him how he could be so stalwart. I always remember his reply. He said, " Because of our faith, my wife and I know that we will be reunited with Dyfrig. We only wonder if he will still be a young boy or a grown man"
He and I would think now his wife, are buried with Dyfrig in West Wales from where they came. Major Derek Tribble of the Salvation Army. Derek ran what was then the House of Trees Corrective School for juvenile delinquents. He just turned up at the mortuary with a number of young Salvationists who pitched in to the very unpleasant tasking of washing and cleaning the bodies before they could be viewed. Read Charles Nunn's account of his part in the recovery and identification of victims. 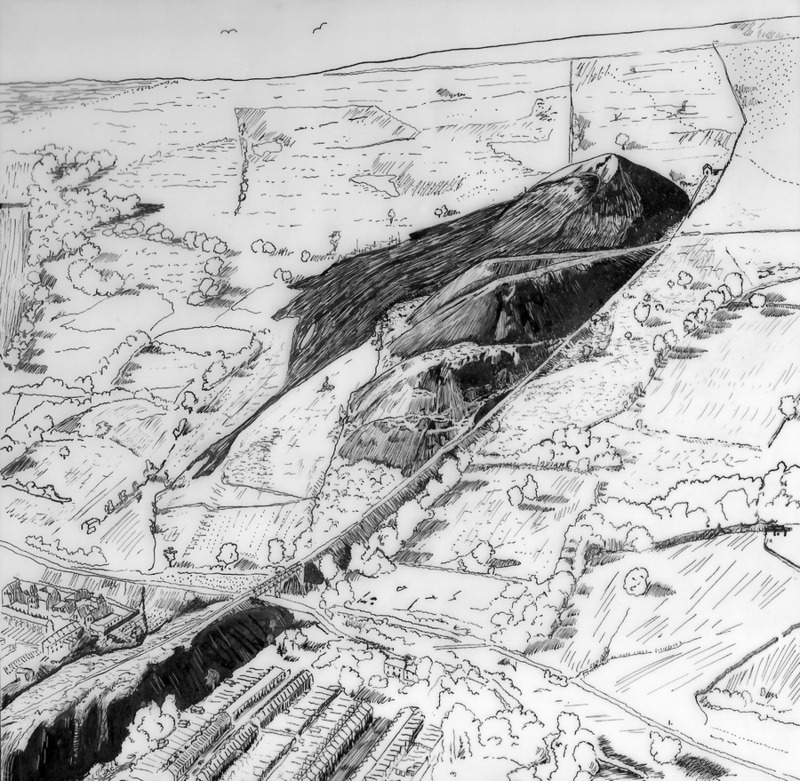 Aberfan Disaster - Pen & Ink Drawing. Your pictures brought back so many memories. I was a young ordinary seaman on board HMS.Tiger which was visiting Cardiff car docks on the day. We all volunteered as a man to help. I still have the Sunday People centre pages picture showing the village bobby carrying little Susan down the corrugated mud slide we had built to help remove the coal slag. My picture is just over the right shoulder of the policeman (left side on picture) I am wearing a ships boiler suit,we took thousands of pounds worth of clothing,field hospital,field kitchen etc with us. I remember the Sunday,even though it was strict chapel,the pubs opened to give everyone of us volunteers a half pint of beer as a thank you. Paul A Taylor ex LS Royal Navy"